Jackets – A good hodge-podge of Non-descript Jackets and Frocks – “Brown Jeans” if possible, other jeans or satinettes are completely acceptable. Richmond Depot Type I’s and Type II’s. Baggage – Civilian Blankets, Federal Blankets – Knapsacks or Blanket Rolls. Oilcloths, tarps and Federal Rubber Blankets as well as Federal Shelter Halves. Overcoats were still being used, CS/Civilian preferred, Federal acceptable. While the following accounts are very descriptive about what Co. K received in late December 1862 in the way of clothing, what Co. K and the 16th Mississippi looked like during the Battle of Chancellorsville is somewhat less clear. It is likely that, given the nature of winter quarters, and light duty throughout late winter and early spring, a good deal of the December 28th, 1862 quantity of “bountiful clothing” sent from Wilkinson County would still be reasonably intact and in use by Co. K during the Chancellorsville Campaign, well worn to be sure. The Wilkinson Manufacturing Company, established in 1851 and owned by Judge Edward McGehee, produced uniform cloth for the men of Wilkinson County until Federal Cavalry burned down the factory in July of 1863. There is only one description of McGehee’s cloth and that comes from Pvt. David Holt in the fall of 1861, that it was “Brown Factory Jeans.” To be sure, this description comes a little over a year and a quarter before Co. K received their clothing from home, but it’s not unreasonable to conclude that similar material was being produced for the suits that many of the “boys” were said to be “strutting around in.” It is also evident by accounts that men continued to receive items sporadically from home through the late winter/early spring of ’63. Posey’s Brigade, throughout the spring of ‘63, was also drawing clothing sporadically. It is likely that these men were starting to see clothing from the Richmond Depot. "We received our clothing and shoes on the 28th of December, and they came just at the right time, for we needed both and thankfully received them. After the distribution of the clothing, the whole company, ragged and dirty as they were, manfully withstood the appreciation of cold water and promptly displayed, to the envy of the other companies of the regiment, their new duds, and many were the shouts that loudly arose for the ladies of Wilkinson County........The weather is extremely cold, today being the most severe of the winter thus far, but thanks to our homemade overcoats and abundant supply of tarps recently received, we managed to keep quite comfortable. Fletch and I have five blankets and our overcoats...the whole company have more blankets and clothing than they can carry to save their lives. I only wish our whole army were as well provided for, even our regiment. It would be a matter of no small import. I can tell you I am pleased with my new overcoat. It fits me well, and the pockets are the most convenient I ever saw..."
"Shoes sent from home arrived today. There were welcome, as our boys were in great need of them. The boys were _____, each fellow eager to open [his] bundle to see what it contained from home." "We remained in town Christmas Day, and yesterday until late in the evening when our company was sent to camp to draw clothing, our clothing from home having arrived and this morning nearly all the boys except myself can be seen strutting about in a new suit and even I drew a pair of pants, drawers and a shirt so you will see that I am most bountifully supplied with clothing – having an old and new pair of pants, four shirts, three pr. drawers, five pr. socks, a coat and a tolerable god pair of shoes. The boys are all well and seem to be in fine spirits since receiving such a bountiful supply of clothing from the kind citizens of Wilkinson County and especially from the ladies military aid society." "I received a pair of gloves by Kann. They are very neat, and I am much obliged as they came just at the right time. The gloves Miss. G. made for me were of more service than any I ever had before, I believe. Thanks to her industry." "Package received of clothing and cookies (cookies crushed)." "2 Sh'ts, 1 hat, & ambro"
"Dull in camp. Worked at Commissary report today. Order read at dress parade yesterday for the troops to prepare for the summer campaign by sending back their surplus baggage." Corporal Rice Bull, 123rd New York Infantry, as he lay wounded on the field, Bull describes the oncoming line of Confederates on May 3rd. "We have armed our regiment off of the battlefield with their Enfield and Springfield rifles, the best gun that the Yankees have in service"
The Inspection Report of Harris’ Brigade (Formerly Posey’s) in November of 1864, also shows an even mix of Springfields and Enfields, confirming Wilson’s claim above. On the nights of May 1st and May 2nd, 1863, Posey’s Brigade is well documented to have spent both nights lying on arms. While sleeping with accoutrements on can be somewhat less than comfortable, in this case, it is very well documented and can provide you as a historian with a unique experience in matching accounts with a physical experience. Both nights, the 16th Mississippi was within a few hundred yards or less of the Federals and skirmishing was kept up through the night. NOTE: Pvt. Higgins was attached to the Brigade Commissary and therefore, is particularly descriptive of rations being issued to the troops. Pvt. James M. Higgins. Injured at Sharpsburg, rejoined Co. K in January 1863. Image supposed to have been taken between Fredericksburg and Chancellorsville. "Slept quite cold last night, rose early this morning. Rations were issued to our Regiment very early - things are getting very tight in the way of food. One pound of flour, a quarter pound of bacon (no beef) per person..."
"Some of the boys in our band got a squirrel up a tree and cut the tree down - and being seven or eight in number, they soon caught it. We had for a variety today a pot of apple dumplings which, being very well sweetened with sugar, tasted very well indeed, and our rations being only bacon and flour - and not very plentiful, it was a great acquisition to our humble dinner"
"Got a cup of genuine coffee today"
"We drew rations of flour and bacon, and for variety some molasses, but it was a little sour. Speaking of rations reminds me that yesterday our sutler brought into camp some turkey, already dressed, which he sold to some hungry members of our regiment at the very moderate sum of 'two dollars per pound'." "The men are cheerful, and I receive but few complaints; still, I do not think it is enough to continue them in health and vigor, and I fear they will be unable to endure the hardships of the approaching campaign. Symptoms of scurvy are appearing among them, and to supply the place of vegetables each regiment is directed to send a daily detail to gather sassafras buds, wild onions, garlic, lambs quarter, and poke sprouts, but for so large an army the supply obtained is very small. 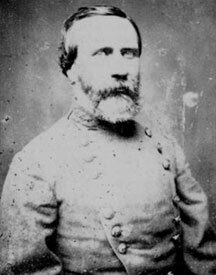 I have understood, I do not know with what truth, that the Army of the West and that in the Department of South Carolina and Georgia are more bountifully supplied with provisions. I have also heard that the troops in North Carolina receive one-half pound of bacon per day. I think this army deserves as much consideration as either of those named, and, if it can be supplied, respectfully ask that it be similarly provided. "We gave out rations to the Regiment for two days - flour, bacon, rice, molasses, and vinegar." "Package received: cookies, biscuits, dried fruit, salt meat & gloves. Originally sent to Anderson’s Brigade, not Anderson’s Division." "Some trying to drain a pond for fish." "You wanted to know what I had to eat and do. I have flour and bacon to eat and have to watch the Yankey." "The rations for our Brigade were cooked yesterday evening and sent forward by the men who were detailed to cook..."
"Rations were started to the Regiment this morning at daylight - consisting of hard bread, ham and sugar." Dobbins, Austin C., Grandfather’s Journal: Company B, Sixteenth Mississippi Infantry Volunteers, Harris' Brigade, Mahone's Division, Hill's Corps, A.N.V.